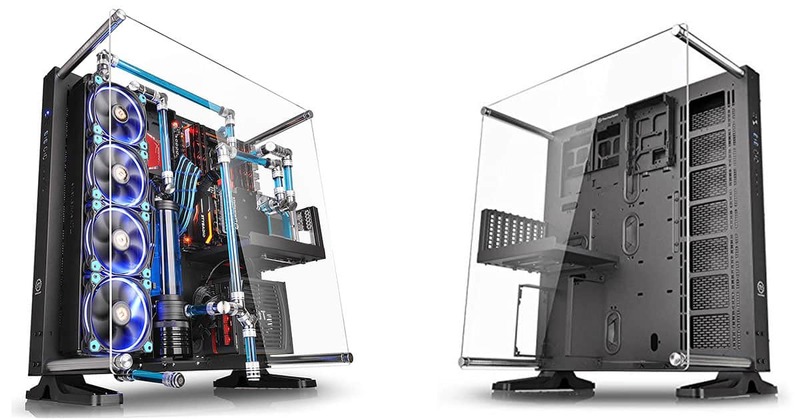 With more and more people building their own PCs or investing lots of money into serious hardware, it is no surprise that tempered glass PC cases have massively grown in popularity. 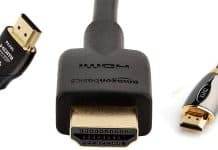 After all, wouldn’t you want to show off your hard work or hardware that would otherwise be hidden inside your PC case, not able to see the light of day? As the trend towards the use of transparent glass cases has grown, manufacturers have been quick to jump on the trend. 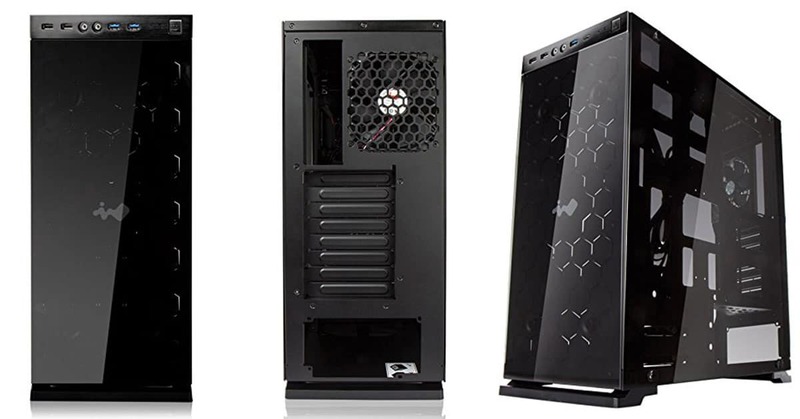 As a result, there are now several different options when it comes to these PC cases. If you do not know what you are looking for, it can be hard to make a purchasing decision. Fear not, though—we are here to help! 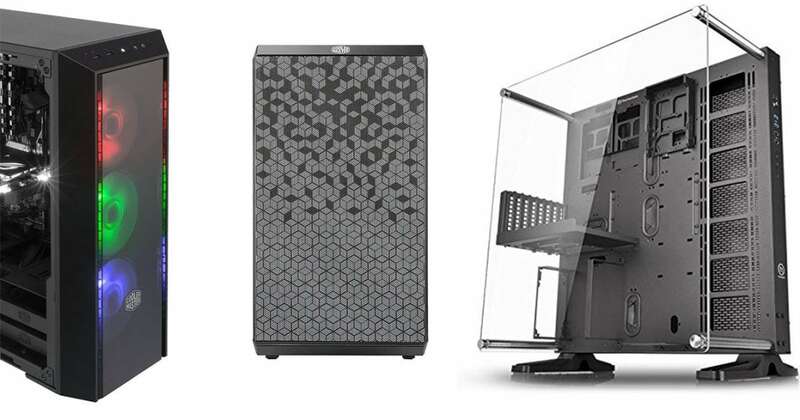 In this review, we are going to take a look at some of the best tempered glass PC cases that are currently available for 2019. Without further ado, we are going to dive right in. 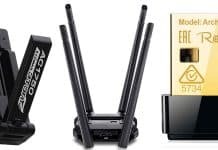 It’s time to begin looking at some of the very best atx, micro-atx and mini-itx glass cases available anywhere on the market right now. Although you may disagree on some of our selections, you are virtually certain to find at least a couple that you like. There is something here for everyone. What Is the Deal with Tempered Glass? Ready to dive in and take a further look at what we have to say? Let’s get to it! Right in at our top spot is the Phanteks P400S. This is a truly fantastic and stunning mid tower atx glass case that is probably more than suitable for what you need. 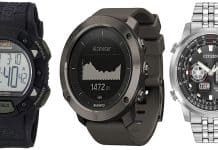 Before you go any further, we recommend taking a look at this product’s page. You may not need to read the rest of our review! A sleek full metal body is complemented by a stylish tempered glass side panel. This provides all the benefits without being too overbearing. With such computer cases, virtually all the case aside from functional areas such as ports are made from glass and whilst this is great for some people, it is too much for most of us. Instead of going overboard, Phanteks have opted to simply have one panel made from tempered glass and we think it looks fantastic. The tower itself has plenty of room to fit even the beefiest of modern GPUs. It also has a lot of extra features to help you build a functional PC. There are two case fans included that are 120 mm each for optimal airflow, it is soundproofed, and is highly functional. For fans of minimalism, the front of the tower itself is plain; all the buttons and ports are hidden. There’s a clean cable management system that uses Phanteks’ own hoop-n-loop cable tie system. Supporting water cooling, sporting a removable HDD cage, a water pump, magnetic dust filters, a 10-color RGB downlight and adjustable fan speeds in addition to all the above, this is a magnificent computer case, and, in our opinion, it is by far the best… there’s no competition for the top spot! Some manufacturers struggle to strike a good balance between appearance and performance. This is truer when they make tempered glass cases, but not Masterbox. The Pro 5RGB is just as good looking as it is a good performer. 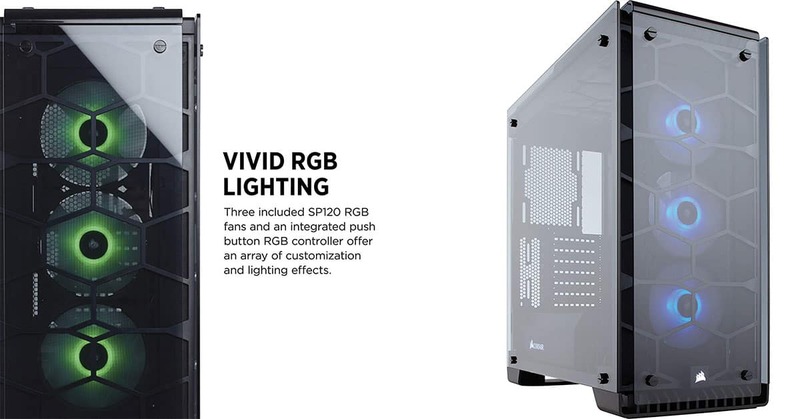 Turning to the case’s appearance first, there are two glass elements to it—a side panel exposing the case’s interior and the front panel which exposes illuminated fans with 5RGB coloring options. The case itself is fairly mid-sized and is big enough for most users to house their rigs with relative flexibility. It is very easy to mount, dismount, and rearrange the various components inside the case itself. In terms of cooling options, it is hard to miss the three huge fans housed at the front of the case. These are nestled behind a glass panel. The fans are 120 mm RGB fans and, in addition to this, there is another one on the rear. This provides next-level cooling. It’s is clearly a great option for anybody who has a powerful rig and needs to keep temperatures in check. There’s even the option to add in additional 360 mm front radiator for liquid cooling. If you are looking for something that looks good without sacrificing quality, you can’t go wrong with MasterBox. When everything is set up and you have configured your lights, it looks gorgeous! Although it is a little more on the expensive side, if you want a truly beautiful case that shows off all your computer’s components then you’ve found it—this is as close as you can get to an entirely transparent case! The Core P5 ATX Wall-Mount Chasis is the older and bigger brother of the P3 that provides additional capacity for the installation of a water-cooling system. Featuring tempered glass top, front, back, and side panels, everything is on show. Versatile, the case can be stood up, laid down, and even wall-mounted. Most people just opt for the first option, though. One negative of the Core P5 would be the lack of lighting; there’s great potential for this given that this is a predominantly glass build. In terms of ventilation, it’s pretty standard. The unit itself does not come with any fans but these can be installed. Air, however, can escape through the cracks between the glass casing and through ventilation on the metal side panel. Featuring a tempered glass top, front, and sides, the Corsair 570X looks fantastic… and this is exactly what you want if you are spending good money on a computer case. With four of these panels, every component within your rig is on display for everybody to see clearly. It is called the 570X RGB because of the RGB lighting with its own integrated controller. 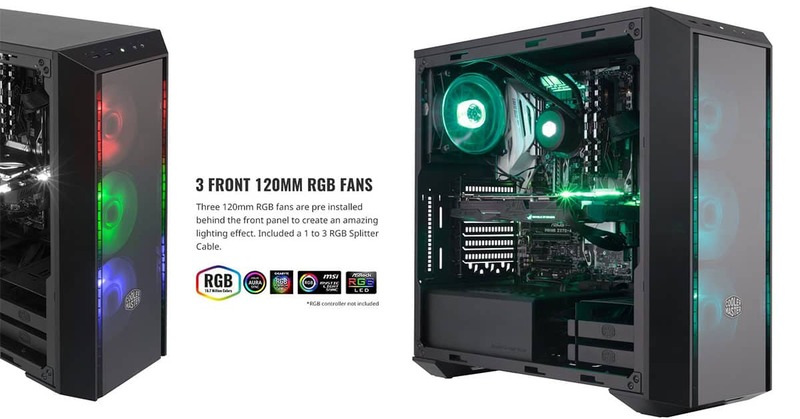 The case also comes with three SP120 RGB fans. These can be manipulated by this controller for lighting effects and color customization. So far as tech is concerned, this is another mid-sized tower that has plenty of space for experimenting with components. You can install up to six 120 mm fans in addition to 240, 280, or 360 mm radiators. Air escapes through lots of vents on the back of the case. Storage space is expansive and there are intuitive mounts upon which two 3.5-inch HDDs and two 2.5-inch SSDs can be installed. This is a very tidy looking computer case, and this is helped with the clever cable management system—in this case, Corsair have included lots of cable channels and Velcro ties to make sure everything remains tidy and hidden. The Cougar Conquer ATX is a case specially made for gamers. When compared to others in this list, it stands out in terms of its appearance and shape. We personally think the case looks brilliant and is a standout piece that will very quickly turn into a talking point in any home. 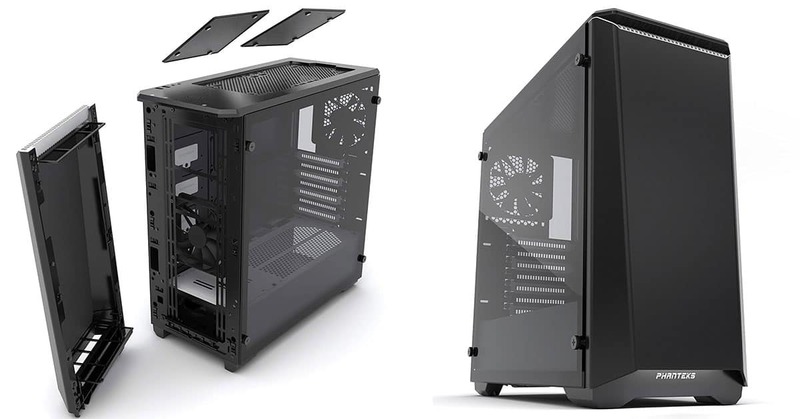 Both sides of the Cougar Conquer ATX case feature tempered glass. This prominently stands out from the rest of the case for a truss-style aesthetic. This is complemented nicely by aluminum framing for immaculate detail. Three pre-installed Cougar CFD 120 mm LED fans provide optimal cooling with plenty of ventilation through the glass because it is not fixed flush with the aluminum housing. 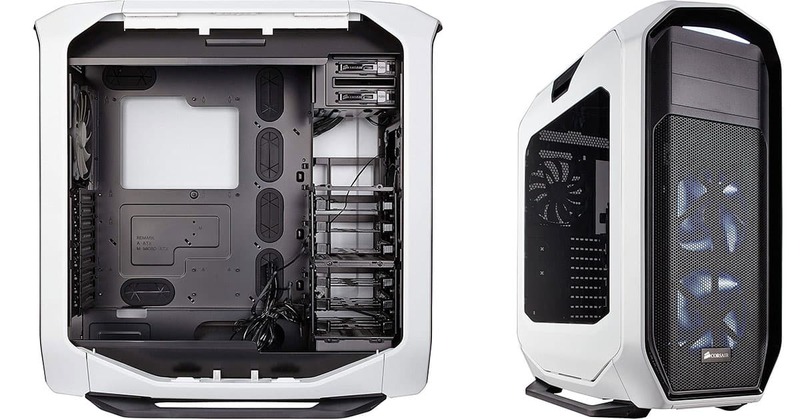 Additional fans and ventilation can be installed on the top, allowing the Cougar Conquer ATX to stand up to any game played on it without inhibiting performance or overheating. This can be supplemented by a 360 mm AND 240 mm water cooling. In addition to having lots of room, the case can support 350 mm graphics cards. It also has additional reserve spaces, four 2.5-inch drive bays and 3 3.5-inch drive bays… that’s 7 reserve storage unit slots! Design not to everyone’s tastes. You don’t need to spend a whole load of money on a tempered glass case to have something that looks nice—the MasterBox Q300L by Cooler Master manages this nicely. The Q300L features a single tempered glass side and is a mid-sized glass computer case that is big enough to support up to a 380 mm graphics card. Although this may not be the best case for gamers, a 380 mm graphic card is plenty big enough for general use. It’ll even run some games, including newer titles! On the front and sides, a dust filter can be attached thanks to the presence of magnets. These filters feature perforated fronts, tops and bottoms for good airflow and high-performance. There is a chunky fan at the rear of the case and plenty of ventilation. Even though this is a cheaper model, Cooler Master have still included 28 mm of open routing space for the hiding of cables. Additional 120 mm fans can be installed at the front and the case supports a 240 mm radiator. Can support a decent GPU. Additional fans can be added. A radiator can be added. May not be suitable for more advanced rigs. 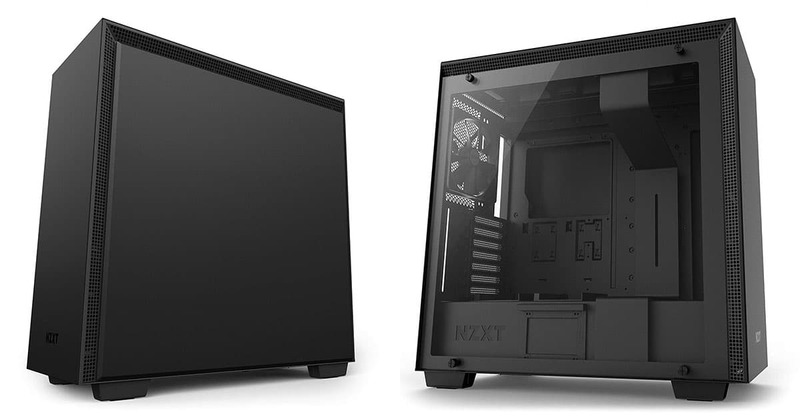 An all-steel case with one side made from tempered glass, the NZXT H700 is a very basic option that still provides a great deal of flexibility. Although this case strays away from the more ‘minimalist’ look and instead opts for a more traditional ‘typical’ computer tower look, it still looks great! The panel showcases the computer’s innards whilst the indented front panel provides an air of modern style. Included in the case are four 120 mm fans. These have been optimized for internal airflow. Ventilation on both the front, back, and sides, even where the tempered glass is, means that your hardware remains cool and performing at its maximum potential. A cable routing kit with channels and straps lets you easily hide your wiring. Plus, there are three quick-release 2.5-inch SSD trays found on the PSU shroud. In addition to this, the case has 2 2.5-inch steel trays behind the motherboard and 2 3.5-inch drive cages under the shroud. With plenty of space, lots of expansion slots, optimal cooling, and a stylish modern look, this is a great basic tempered glass pc case. Lots of trays for SSDs. Cable routing kit with straps for wire management. Quick-release SSD trays make for easy installation. If you are looking for a sleek and rounded design instead of something that is boxy and bulky, the Corsair Graphite 7830T is a great shout. There are three options, too. You can buy the case alone, the case with a fan, or the case with a PSU. So, if you have your own fan and don’t need one included, you don’t need to spend time replacing it. In comparison to other glass computer cases, the glass panel on this model is relatively small and discrete. This is great if you are looking for something simpler and less shouty. Both side panels are latched and can be removed easily for access, and the front panel features a three-mode fan controller to let you set the fan speed and noise. There is ample airflow provide by dual 140 mm intake and output fans. There is also plenty of ventilation through the top, sides, back, and front. All ports are located on top of the tower. This means the front remains low-profile and uncluttered, allowing for a more modern look. The case supports additional 360 mm radiators for further cooling, and there are 6 HDD cages and 3 SSD bays for additional storage. A nice change from the ‘boxy’ designs. Sides are latched and can be removed easily. Good airflow provided by intake and output fans. Only a small glass panel on one side. The InWin 805 Black compact Mid Tower case is a great mid-tower product that is made from brushed aluminum and tempered glass side panels. On the front, there is a hexagonal lattice design that, when illuminated with LED lights, looks stunning and make this a stand out computer case. It is great in terms of overall design, but how’s the performance? This mid-sized tower case has been designed to allow for flexibility. To that extent it includes versatile modular HDD cages. Ventilation is provided through a built-in fan and lots of vents. Additional 120 mm fans, up to five, can be installed for better cooling. 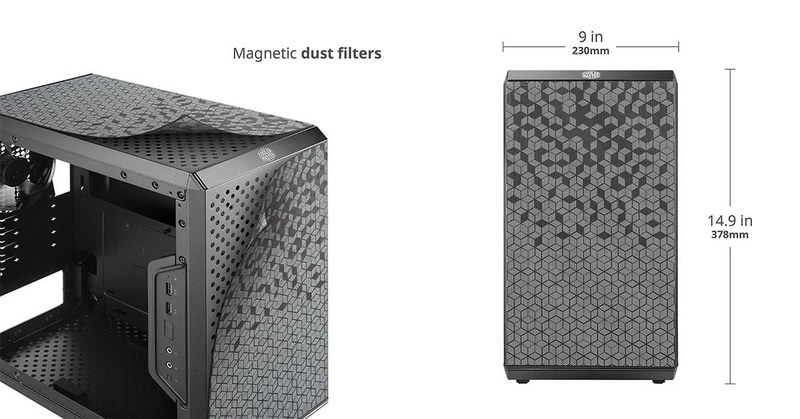 It includes a magnetic dust filter, too. On the front you will find 2 USB 2.0, 1 USB 3, and 1 USB C port. It’s nice to see ports on the top of computer towers. We think that it looks fine and they even complement the design. Brushed aluminum plus tempered glass looks great. Hexagonal design illuminates for a stylish and eye-catching look. Built with flexibility in mind. Up to five additional fans can be installed. Ventilation could be better but it is still suitable. for a starter build, though, there’s no denying that. As you can see, it is entirely made from tempered glass aside from one side to which your computer’s hardware is mounted securely. There are multiple options for installing hardware. 2 external bays measuring 2.5 inches and one internal bay measuring 3.5 inches gives you lots of flexibility. The front panel features 2 USB 3.0 ports and an HD audio plug. Just because it is a miniature case does not mean it is lacking on other elements, though. 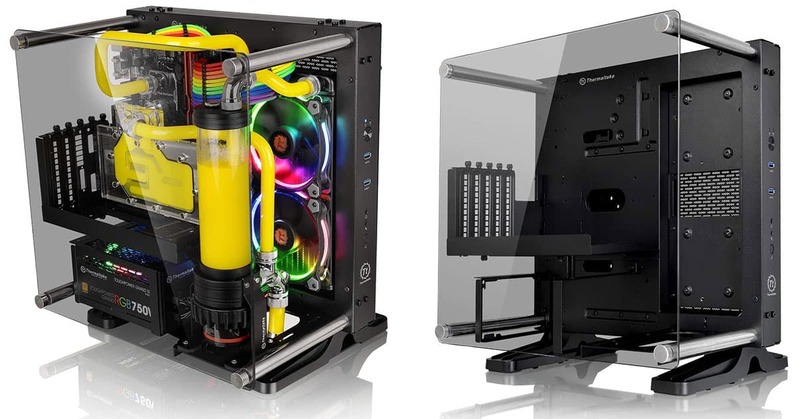 There is a cable management system to keep your rig looking tidy, and the tempered glass is 5 mm thick. Remember that this is a more basic model and to this extent, it does not support optical drives. Although the design is plain, clean, and compact, there is still more than enough room to suit most people and their builds. Small in size but huge in performance, the Core P1 comes last on our list but it is by no means least in terms of anything else. Multiple bays for extra hardware. Small in size but big with performance and features. Made almost entirely from glass. Does not support optical drives. You may have noticed that we are referring to tempered glass, not just glass itself. The major difference between glass and tempered glass is that it’s made in a way that means the glass does not break easily or shatter into dangerous pieces. It is also made to withstand heat, resist temperature changes, and reduce noise emitted by the PC. If you have any other glass furniture in your home such as a desk, dinner table, or shower cubicle, the glass used in these products will also be made from tempered glass. It is also sometimes known as safety glass. If it breaks, it shatters into small pieces rather than shards that are far more dangerous. Tempered glass is around four times stronger than regular glass. It is made with a specialist process, too. This process puts the outer surfaces into compression and the interior into tension. In terms of strength, tempered glass in the U.S. must have a surface compression of 10,000lbs per square inch and, generally, it will break at 24,000lbs per square inch. If you have your own computer rig already or are considering building one, why not take it to the next level with a such glass case? These are brilliant things that look fantastic and never out of place in modern homes. It lets you show off your computer’s hardware without putting it at risk to the elements, pets, falling objects, or other people. It is only natural that you want to show off your build after spending a whole lot of time researching and building it, and that’s not even taking into account the expense! 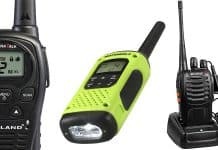 The cases we have included in our list represent the ten very best cases suitable for gaming in 2019… you will be hard-pressed to find anything better than what is covered here. 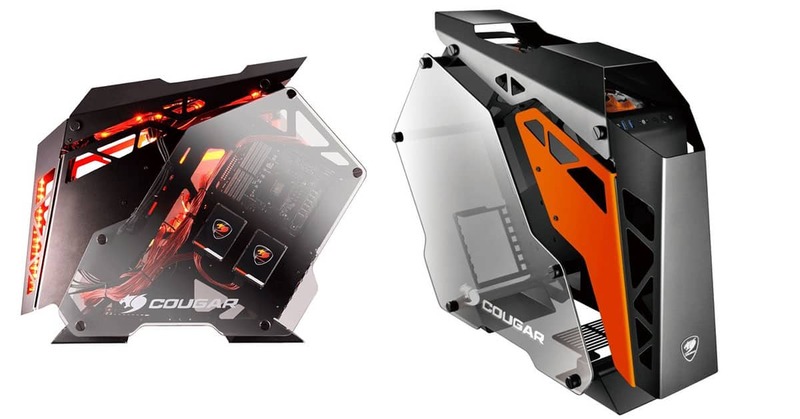 All the glass cases featured will be suitable for most people, however, there are a few distinct high-performance ones thrown in for good measures, such as the Cougar Conquer ATX. Our personal favorite is the Phanteks P400S that features everything a regular user could need, and then some. It looks brilliant with a plain and minimal front. This is complemented nicely by the single tempered glass side panel. We think that this strikes a nice balance without being too overbearing. If you want something a little flashier (literally!) then there are plenty of options incorporating LEDs and customizable RGB fans. It’s all about personal preference, really. What do you think? Leave a comment down below and tell us which one you went with and why. Previous articleEpic Games – Steam competition in the making?